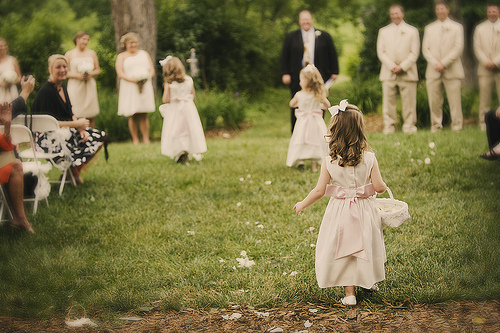 When you feature a flower girl in your wedding ceremony, you want her to reflect the spirit of innocence, radiance and peace of the event itself; while adding an element of drop dead cuteness that will make this precious little girl a hit with the gathered crowd. Choose a dress that mirrors the bride’s gown. Every flower girl will shine in a gown of ivory white lace, herself carrying a bouquet of ebullient florals that she’ll dispense down the length of the aisle. Her angelic couture could set the mood for the rest of the ceremony. Choose a dress that reflects the color scheme of the wedding. Whether your color scheme shines in classic accents of pink and ivory, or resounds with more modern hints of scarlet or lavender—and whether your overall style reflects a Victorian, Renaissance, or contemporary style—your flower girl could stand as a walking representation of your décor. Choose a dress with a floral design. This might seem like a proverbial no brainer to many wedding planners; indeed, when the crowd sees the little girl in the floral print dress, they will automatically guess her role in the wedding. In addition, her beautiful, elegant gown is sure to lend itself to the overall look and mood of the ceremony. Choose a floral headpiece. Regardless of the color or design of the flower girl’s dress, it always pays to ‘say it with flowers’ when it comes to the headpiece. A floral headpiece is a flawless finishing touch for any flower girl wedding costume; just make sure that the hue of the florals coincides with the color and design of the dress—and, of course, of the bountiful petals that define and symbolize her role in the wedding.